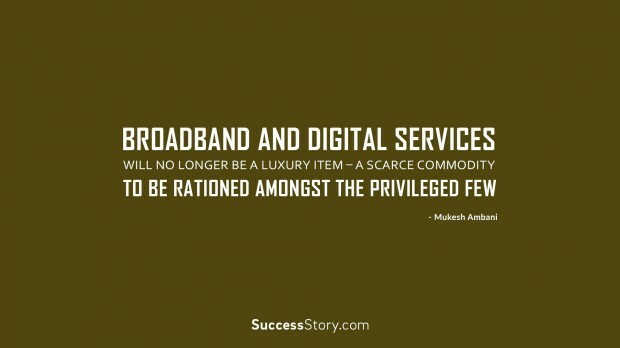 Mukesh Ambani’s quotes have inspired many people around the world, especially in his country, India. He is a well-known business magnate in India, and of the richest businessmen, not only in India, but also in Asia and in the world. 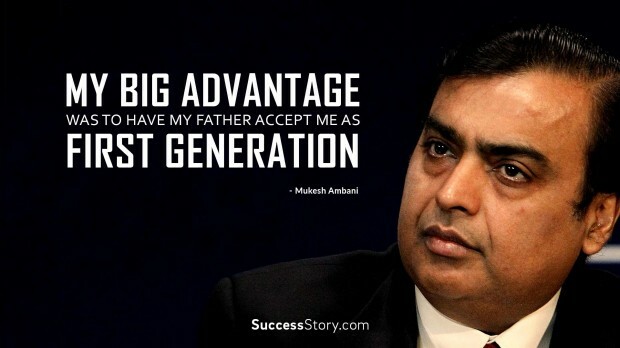 His flagship business, Reliance Industries Limited, is one of the most valuable companies in India. 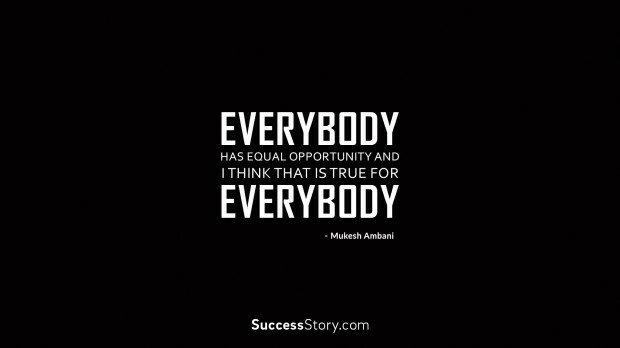 "Everybody has equal opportunity and I think that is true for everything." 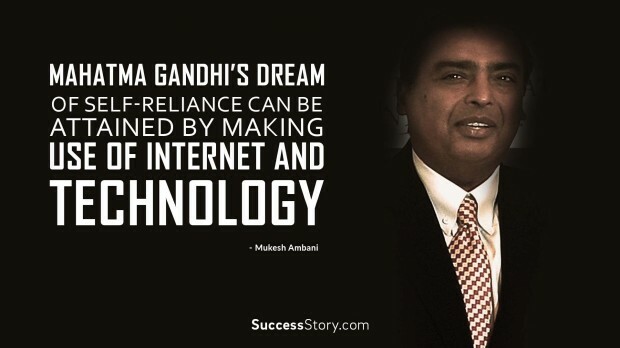 "Mahatma Gandhi’s dream of self-reliance can be attained by making use of Internet and technology"
"I am a big believer that technology shapes mankind"
"Essentially, whoever is successful, whoever is going to do things that make a difference, is going to be talked about"
"Broadband and digital services will no longer be a luxury item – a scarce commodity – to be rationed amongst the privileged few"
"All of us, in a sense, struggle continuously all the time, because we never get what we want. 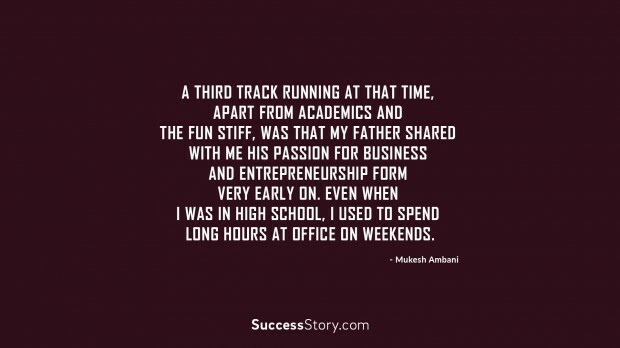 The important thing which I’ve really learned is how do you not give up, because you never succeed in the first attempt"
"A third track running at that time, apart from academics and the fun stiff, was that my father shared with me his passion for business and entrepreneurship form very early on. Even when I was in high school, I used to spend long hours at office on weekend"
"You have to manage money. Particularly with market economies. 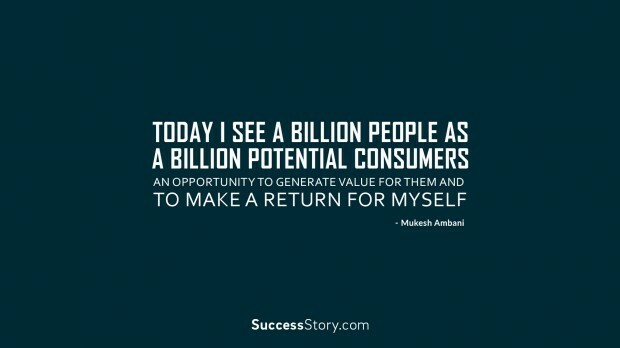 You may have a great product, but if your bottom line bustm then that’s it"
"Today I see a billion people as a billion potential consumers, an opportunity to generate value for them and to make a return for myself"
Mukesh Ambani, whose middle name is Dhirubhai, rose from a humble background to build one of the most successful business empires in the world. His humble life history has fascinated many. He is also owner of the popular Indian cricket franchise, the Mumbai Indians. In recognition of his entrepreneurship, he has received numerous awards, including the Ernst and Young Entrepreneurship Award in the year 2000. 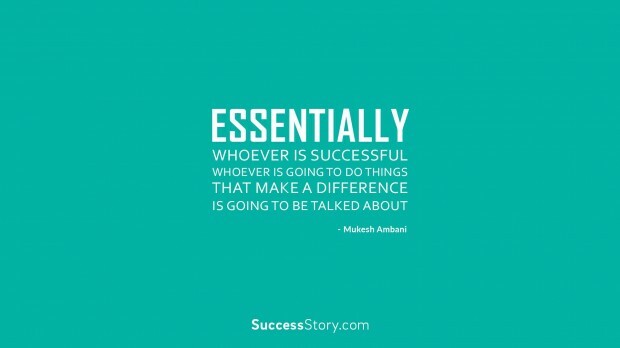 Many people have been encouraged by Mukesh Ambani’s motivational thoughts and quotes, most of which have been translated from Hindi to English due to their broad appeal. 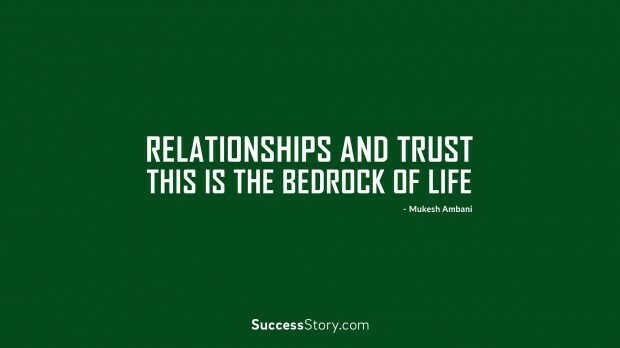 He believes that ambition is necessary for success, but it should be realistic. 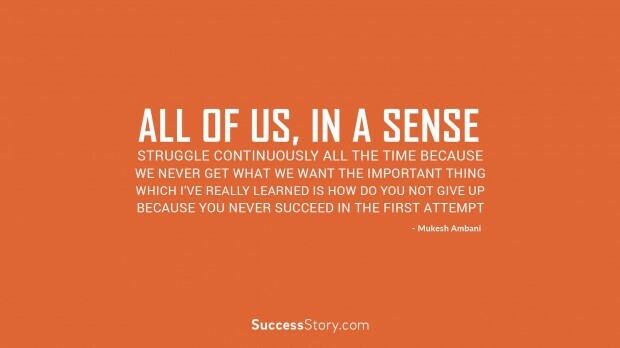 He urges people not to give up, as success is rarely achieved on the first attempt. 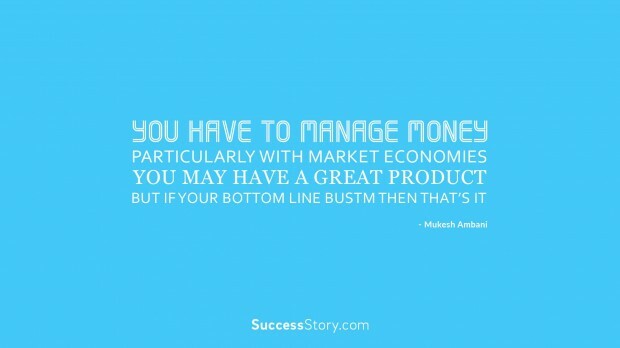 His quotes provide valuable insights in business management. 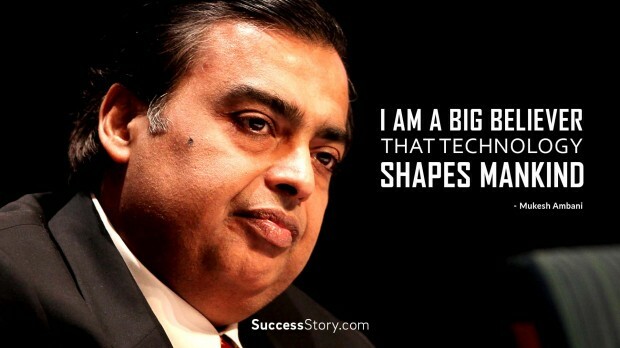 From his quotes, one can see that Mukesh Ambani believes that India is a country of a billion opportunities, not a billion problems. 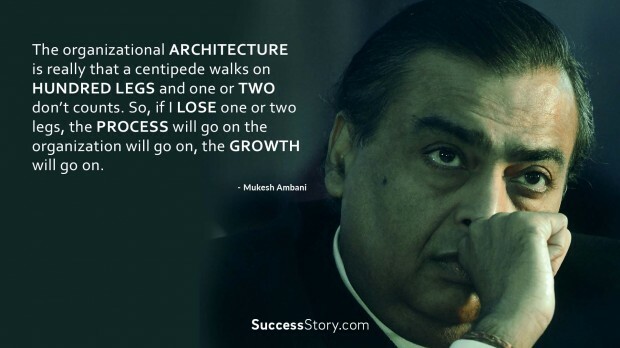 As shown by Mukesh Ambani, success is achievable if one is ambitious, doesn’t give up, and focuses on both personal and business growth.